Yemisi Sanni (popularly called Yemi) is a style artist who loves to tailor every creative aspect of fashion into stylenspirations. She is self-taught with over 20years experience in tailoring and a decade of experience in fashion design. Yemi is a native of the Yoruba tribe from Lagos, Nigeria and is one of ten children. Born to a heritage that reveres Art and where Fashion is in part a tradition of the culture, she identified with fashion as a child and had early hands-on experience in trade with her mom - an entrepreneur who traded in fabrics. In her teens, it was discovered that she had the talent to study a photograph or a garment and be able to reproduce it without instructions. This laid her foundation in tailoring; with practice and dedication, she developed her talents into skills and is building a clothing brand around it. 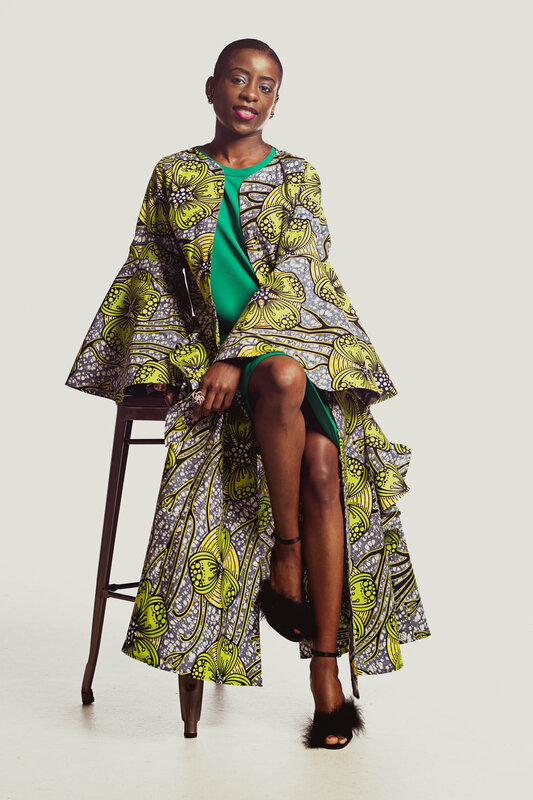 Yemi’s inherent love of fashion keeps her exploring the creative aspects of design and garment making. By 2006, she became exposed to the trade of custom creating special occasion clothing through the work she was doing for her family and friends. The experience that she has gained in this industry has taken her on a discovery journey that is still evolving. With a passionate need to do more with her talents and skills, Yemi keeps pushing her limits, on to next levels. From being a creative craftsman to a designer, she has emerged as a true Fashion Artist. Her designs are crafted uniquely for effortless style and wear, allowing each individual’s persona to shine through in a stand-out fashion. The design and style she creates continues to evolve as the fashion industry spirals with an increased level of enthusiasm for ethnicity and cultural influences in fashion. Established in May of 2013, Stylenspire was birthed from a blogger’s journey to share fashionably inspiring stories that connect the like-minded near and far. Six months into blogging, I noticed the interest a lot of women had in the clothes I made for myself using the traditional Ankara print fabrics. Soon I realized there was a demand I could fulfill and in 2014, I started my ETSY shop to sell uniquely designed Afro-Contemporary clothes for women. The key material in my work is the use of Ankara fabrics (Dutch wax printed cotton) native to most West Africa as a result of the tangled interrelationship between Africa and Europe and their respective economic and political histories. Fashion is the medium that has helped me enlighten people of my Yorùbá heritage, sharing the legacy through the fabrics used in my designs to connect people to Africa. The brand’s style aesthetic is Afro-Contemporary; you see the use of African and Asian inspired fabrics, with a strong Western twist. The combination of these three influences offers an interesting and diverse uniqueness to my work. The fabrics lend the boldness to the clothes which most often are tailored in clean lines and classy cuts. My main focus is on delivering quality, well-made clothing to customers with made-to-measure or ready-to-wear clothing. I work to deliver clothing that help make any occasion special. Be it a “special occasion” or a “because I'm worth it” moment, I aim to showcase an individual’s persona as an enthusiast in the art of fashion, thus identifying her as a Stylenspiration. 2015 ushered in a new phase in my Stylenspiration journey as Stylenspire was inducted into the RAW: Natural Born Artists International Community of Independent Artists. I showcased my debut ‘Simply Woman’ collection at the RAW-Natural Born Artists GRANDEUR event, the MIDWEST FASHION WEEK opening ceremony of EMERGING ARTISTS and at the FASHION HERE AND NOW show at the 45th annual Indiana Black Expo, all in Indianapolis. In Illinois, I showed a capsule collection at the POSH FASHION SHOW. Stylenspire holds the winning title for the 2015 Audience Choice Award for her showcase at the Project IMA – CUTTING LOOSE exhibition, hosted by the Indianapolis Museum of Art (now Newfields). On March 16, 2019, Stylenspire’s “Àwọn ọmọ Yorùbá in diaspora” dress is an installation art at the Indiana State Museum COLOR OF STYLE Exhibition. The idea of the exhibit is that “our clothes tell the story of our lives and the colors of what we wear communicates a message to others”. For Stylenspire, this opportunity reflects the positive contributions that immigrants bring to their adopted lands.